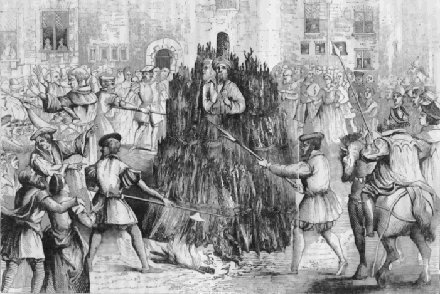 This date in 1533 saw John Frith and Andrew Hewet burned to ashes at Smithfield for Protestantism … just a week before Henry VIII himself was excommunicated from the Catholic Church. A Cambridge man who’d picked up some heresy in Lutheran Germany, Frith was a friend of William Tyndale and did a couple of turns in English prisons for his various transgressions of orthodoxy. He was finally nabbed by a warrant of then-Chancellor Thomas More before he could escape to the continent, and hailed before a doctrinal court for sacramentarianism. During his examination by the bishops, Frith stated that he could not agree with them that it was an article of faith that he must believe, under pain of damnation, that when a priest prayed during the mass, the substance of the bread and wine were changed into the actual body and blood of our Savior Jesus Christ, even though their appearance remained the same. And even if this was so, which he did not believe it was, it should not be an article of faith. All the pieces were in place for this radical theology to become orthodoxy over the succeeding generation. The newly-designated Archbishop of Canterbury — still for the moment within the Catholic fold — was reformer Thomas Cranmer. Despite his sympathy for a shared evangelical cause, Cranmer passed a guilty verdict after trying to talk Frith out of his belief. In the event, however, it was the Inquisitor who was converted: Cranmer over the course of the 1530s adopted Frith’s own view. He would eventually enshrine it in the Book of Common Prayer. All of which, of course, was made possible by Henry’s insistence on ditching his first wife in favor of Anne Boleyn, and Cranmer’s support for that action. On July 11, both the king and his pliant prelate were excommunicated by Pope Clement VII. Still, it must be allowed that this fact scarcely gave carte blanche to Protestant reformers in England. Maybe Frith was made for the flames regardless: as timing goes, the 1530s were great for religious martyrdom. Andrew Hewet, our poor footnote, had no part in these august affairs save the victim’s. Hewet was a tailor’s apprentice who was just caught up with an anti-heretical accusation at the wrong time. In prison, he too refused to acknowledge transubstantiation — saying, “I believe as John Frith believes.” For so believing, he burned as Frith burned. Solomon Molcho, a Portuguese mystic, burned at the stake on this date in 1532 for apostasy. 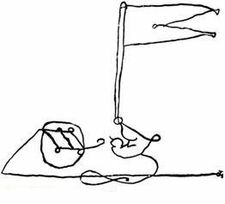 Solomon Molcho’s Shel Silverstein-esque stylized signature. You can see his robe in Prague, or here. He was in Regensberg, Germany with Jewish messianic adventurer David Reubeni meeting with Emperor Charles V hoping to persuade the ruler of the Holy Roman Empire to arm Marranos (Sephardic Jews forced to adopt Christianity) against the Turkish onslaught. Charles imprisoned them both, turning them over to the Inquisition in Mantau, Italy. Reubeni died in prison, possibly poisoned. Molcho, who chose at the stake not to return to Christianity, burned. Molcho’s life ended in flame but started in the warm bosom of the high echelons of Portuguese society. Born Christian to Marrano parents around 1500, Molcho held the post of royal secretary in the high court of Portuguese justice. That is, until Reubeni visited Portugal on a political mission. 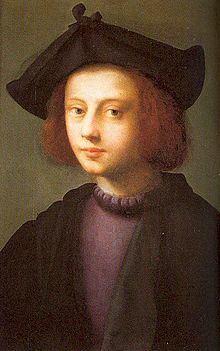 Enamored with Reubeni, who claimed to be a prince descended from the tribe of Reuben, and who had gained favor with Pope Clement VII, Molcho wanted to join Reubeni in the adventurer’s travels. Reubeni refused. Molcho circumcised himself in hopes of gaining Reubeni’s favor. It was all for naught, and so Reubeni emigrated to Turkey. Soon Molcho was wandering through the Land of Israel, a preacher who predicted the Messianic Kingdom would come in 1540. He, too, gained favor with Pope Clement VII and, after studying the Kabbalah, predicted natural disasters like a flood in Rome in 1530 and an earthquake in Portugal in 1531. After those predictions, and dabbling in strange experiments, Molcho claimed himself to be a precursor to the coming Messiah, if not the Messiah himself. This troubled many. Now traveling with Reubeni — one a Kabbalist mystical messianic preacher, the other a peripatetic Jewish dwarf — they sermonized, and allied themselves, where they could. But not with the emperor. Molcho, in the provincial capital of Mantua, south of Lake Garda in the Po plain, was given one last opportunity to convert back to Catholicism. Asking instead for a martyr’s death, Molcho got it.